I am a mom of two sweet boys with another one on the way. I worked in the financial world for 5 years before becoming a stay-at-home mom. If you are looking for some easy decorating ideas for your batch of spider-themed cupcakes, you have stopped at the right place. 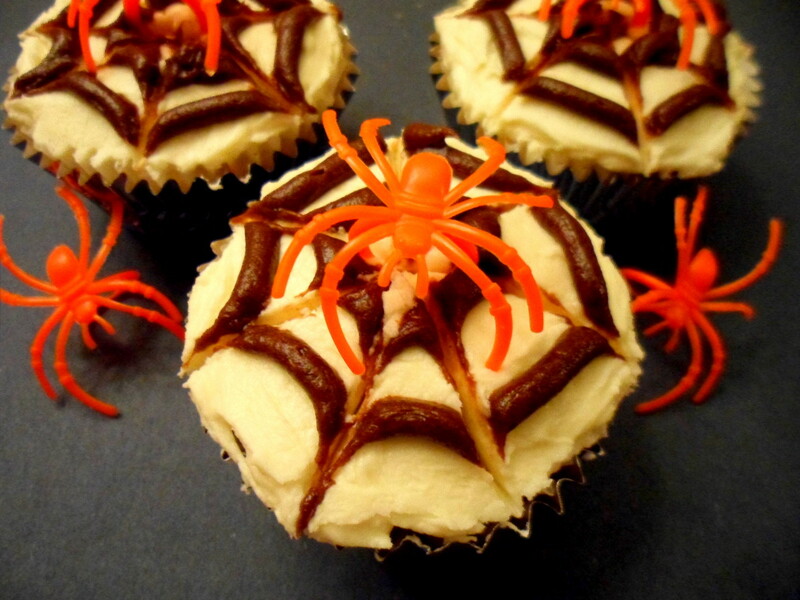 You definitely don't have to be a professional baker to create these simple spider web cupcake designs. Whether you are making a batch for a Halloween or birthday party, or you just need a special treat to take to work or school, your guests will adore the creativity of these homemade cupcakes. In this article, you will find a list of supplies and step-by-step directions for creating three super-easy decorating ideas. 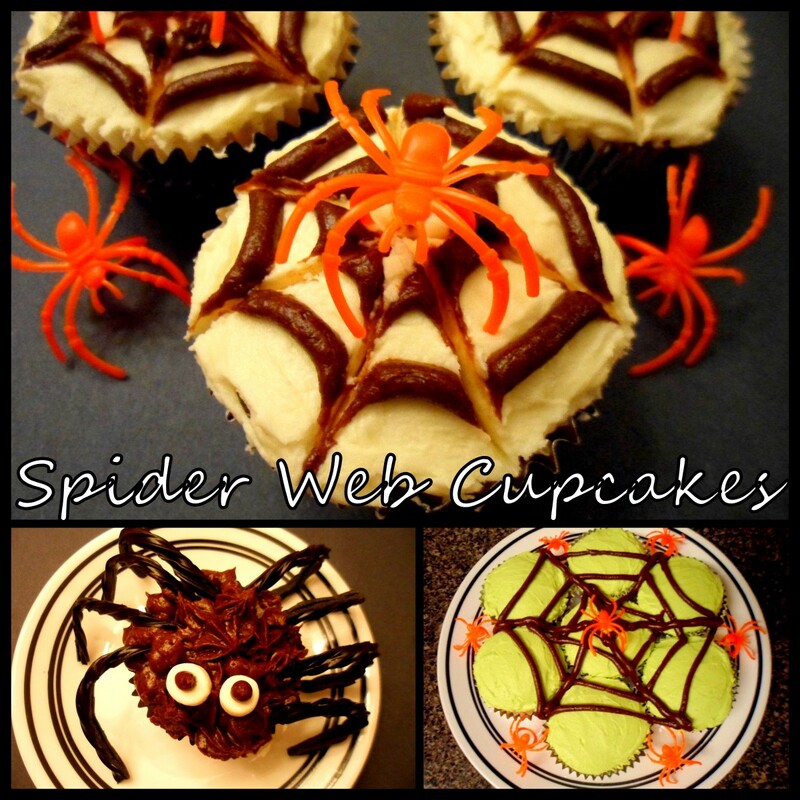 Read further to learn how to make a simple spider web cupcake design, a batch of pull-apart cupcakes in the shape of a spider web, and spooky-looking spider cupcakes. 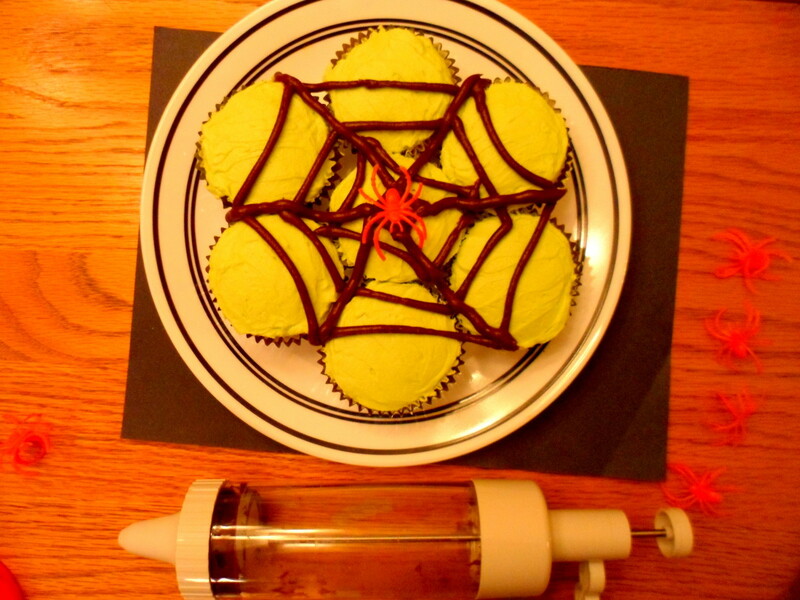 If you need a quick and easy decorating idea for your batch of spooky cupcakes, this spider web design is the way to go. I made these cupcakes for my son's kindergarten class last year and they absolutely loved them. An added bonus is the plastic spider ring that the kids get to keep once they are finished with this delicious treat. Below is a list of supplies and step-by-step instructions for creating this simple cupcake design. Bake your cupcakes according to the directions given on the back of the cake mix box. Once completely cool, frost the cupcakes with white buttercream icing. Using a decorator tool or plastic bag, create 2 circles on each cupcake with the chocolate icing. 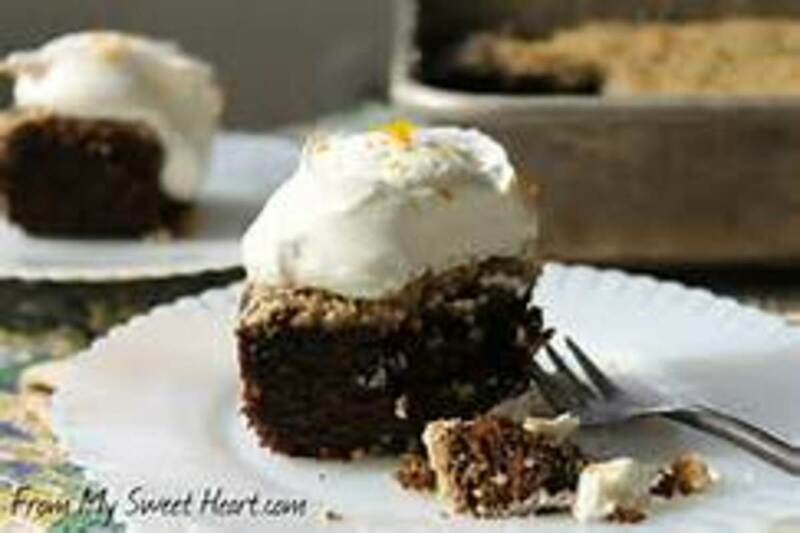 Insert a toothpick into the middle of the cupcake and drag to the outer edge. 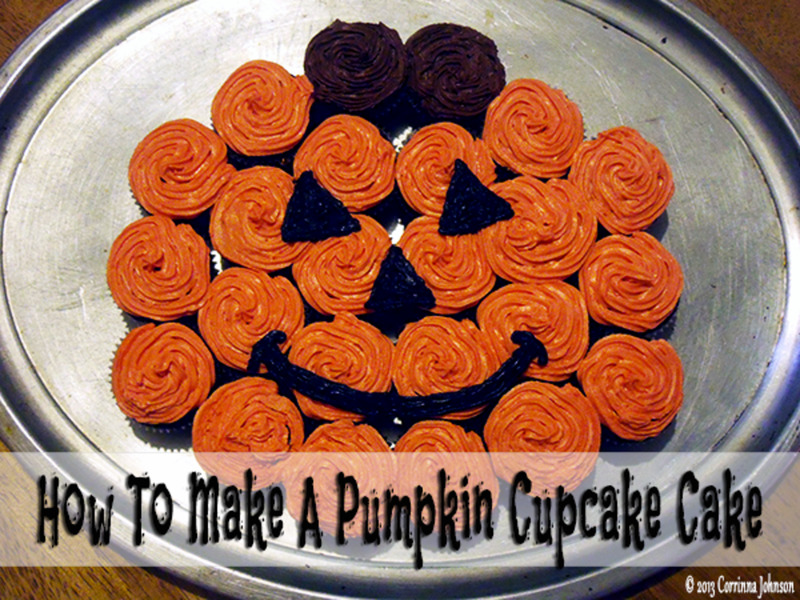 Continue this process all the way around the cupcake to create your spider web. When the spider web design is complete, insert a plastic spider ring into the middle of each cupcake. 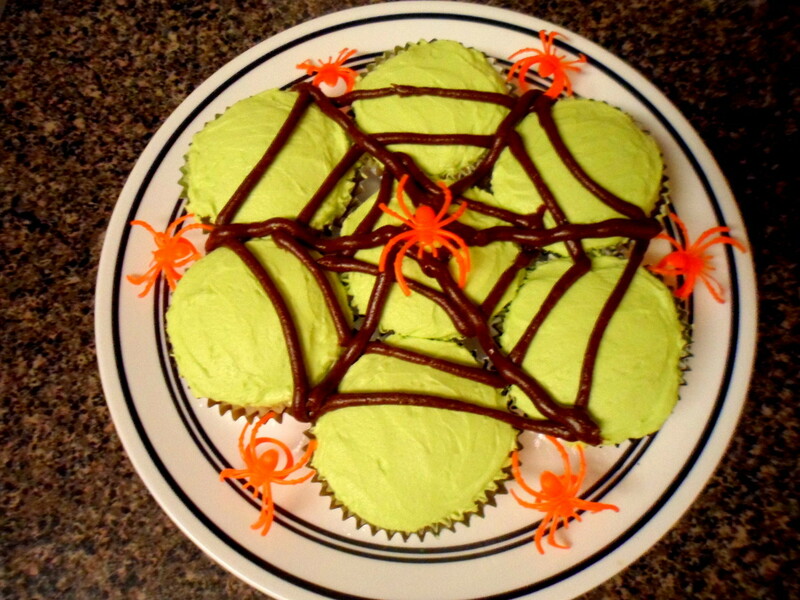 Another quick and easy decorating idea for your spider web cupcakes is to create this fun pull-apart design. 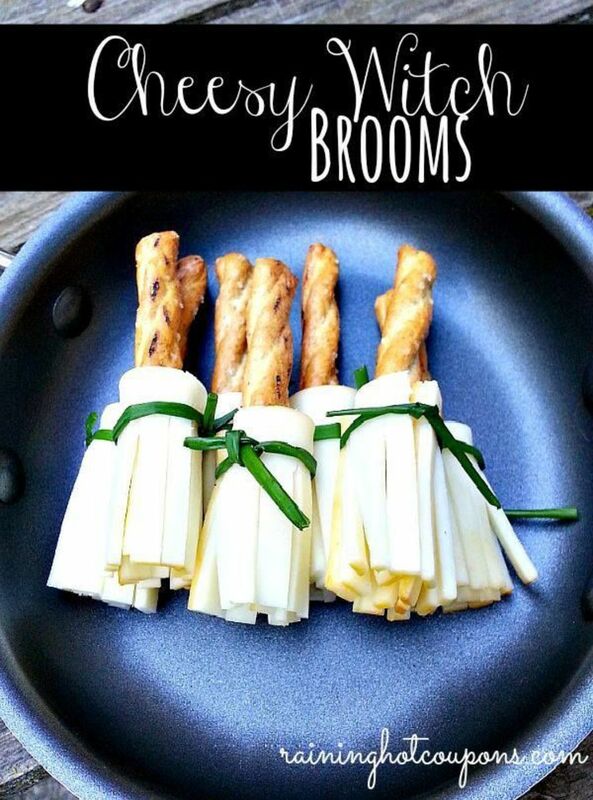 These treats look great served on a large platter for your party guests to grab and enjoy. Although these kind of cupcakes can sometimes create a bit of an icing explosion when pulled apart, I tried to lessen this problem by frosting my cupcakes individually and only connecting them with the web made out of a thin layer of chocolate icing. Here is a list of what you will need and directions for creating this pull-apart cupcake design. 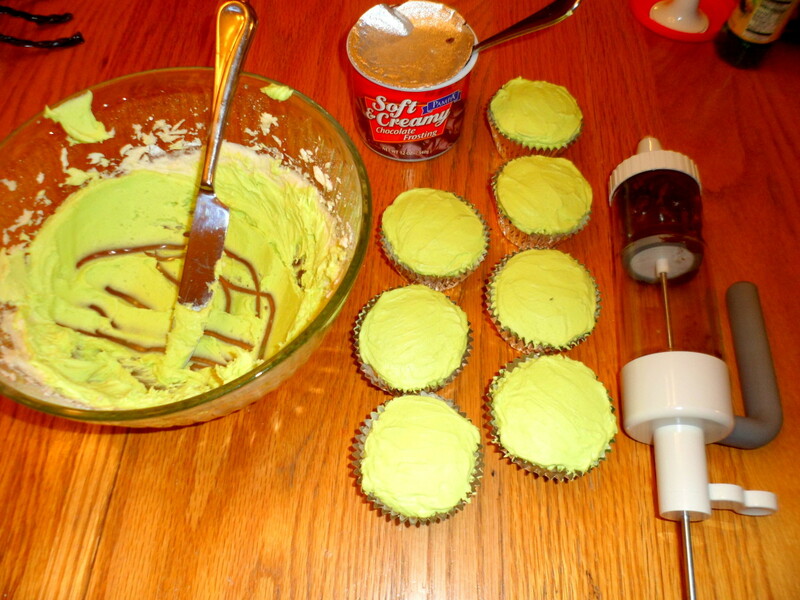 Bake and completely cool cupcakes according to the directions given on the box. 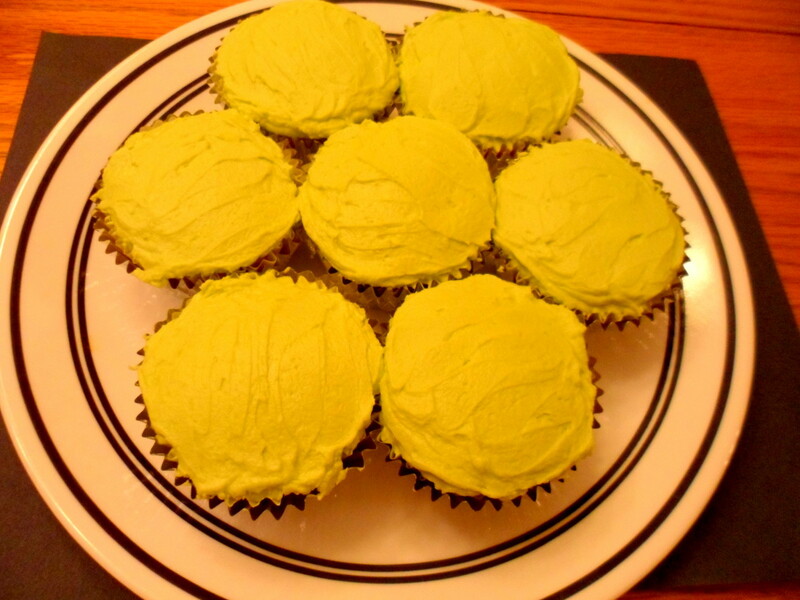 Whether using store bought or homemade buttercream icing, add 3 drops of yellow and 1 drop of green food coloring to achieve a lime green color. After frosting your cupcakes, arrange them on a serving platter in a circular shape. Fill a decorator tool or plastic bag with chocolate icing and slowly squeeze the icing out to start creating the web design. I started on the outside and worked my way into the middle connecting each cupcake into the spider web. 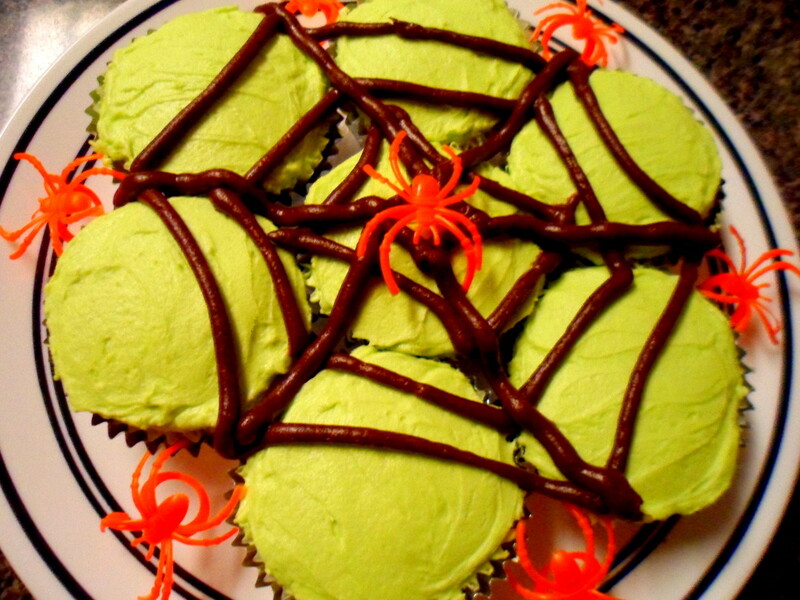 When finished with the design of the web, add plastic spider rings to the middle of the web and all around the platter to complete a more spooky appearance to the batch of cupcakes. 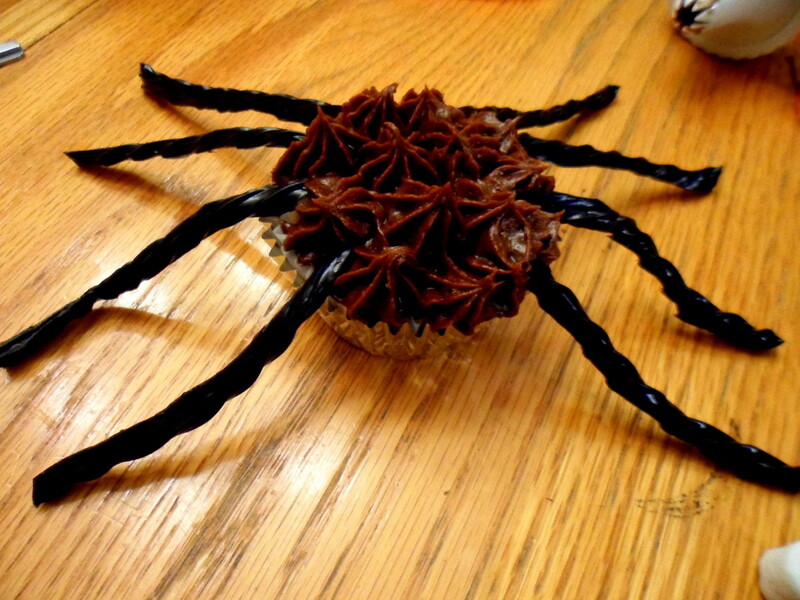 Before inserting the spider legs into the cupcakes, bend the black licorice into your desired leg shape. 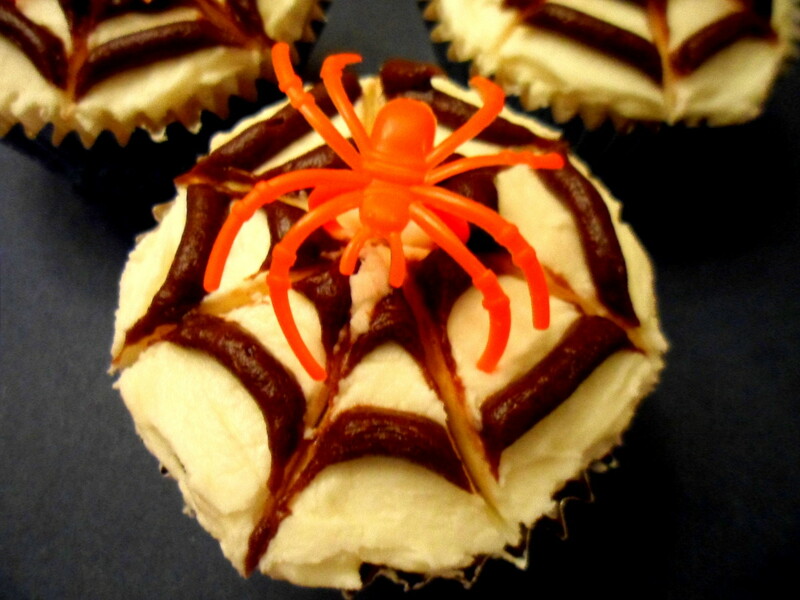 If you try to shape them after inserting, it will mess up the appearance of the "hairy" icing on the spider's body. 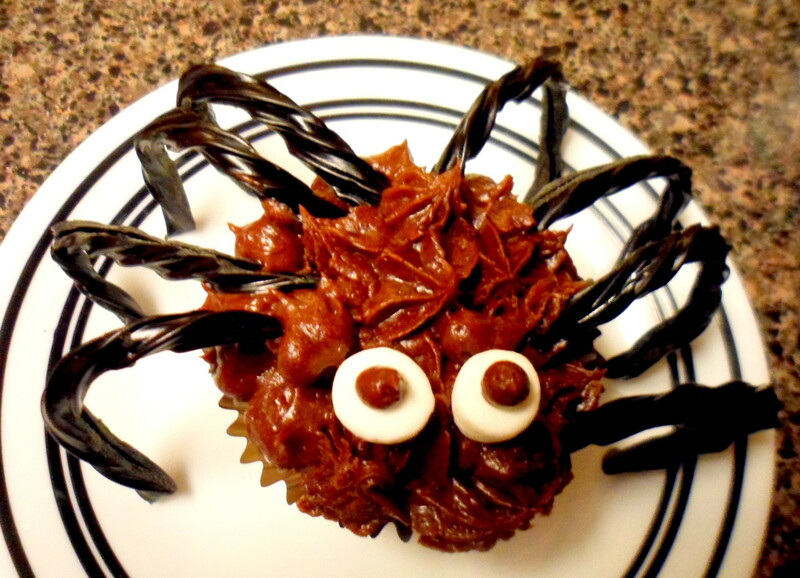 Our final easy cupcake decorating idea is this fun design made to look like a creepy, crawly spider. Both kids and adults will go crazy once they see these treats decorated with yummy chocolate icing, marshmallows, and black licorice. These cute cupcakes would look perfect on the food table next to a platter of the pull-apart spider web cupcakes. Below is a list of supplies and step-by-step directions for creating these spooky spider treats. After baking and cooling the cupcakes, fill a decorator tool or plastic bag with chocolate icing. I used a star shaped tip and squeezed drops of icing onto the cupcake to create a hairy appearance for the body of the spider. 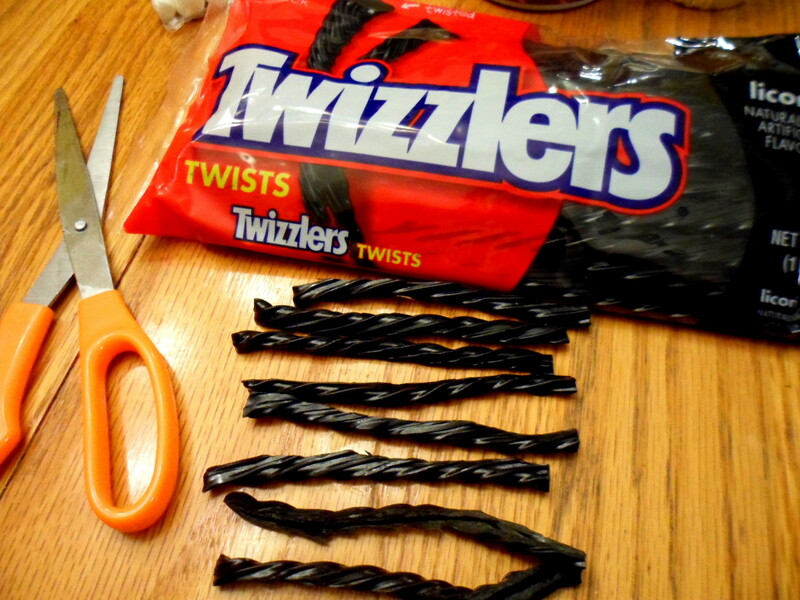 To create the spider legs, cut and half a piece of black licorice both width and length wise. 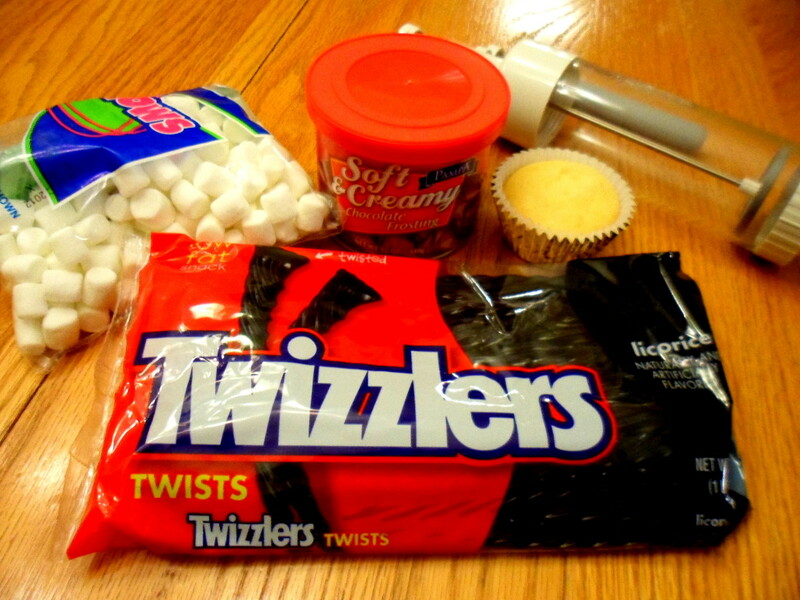 Repeat this process with another piece of licorice to create the 8 legs needed for each cupcake. Insert the legs into the chocolate icing. Add 2 small marshmallows to each cupcake to create the eyes. Drop a dot of chocolate icing to both marshmallows to finish this batch of spooky spider cupcakes. Place an M&M on the top of each cupcake. 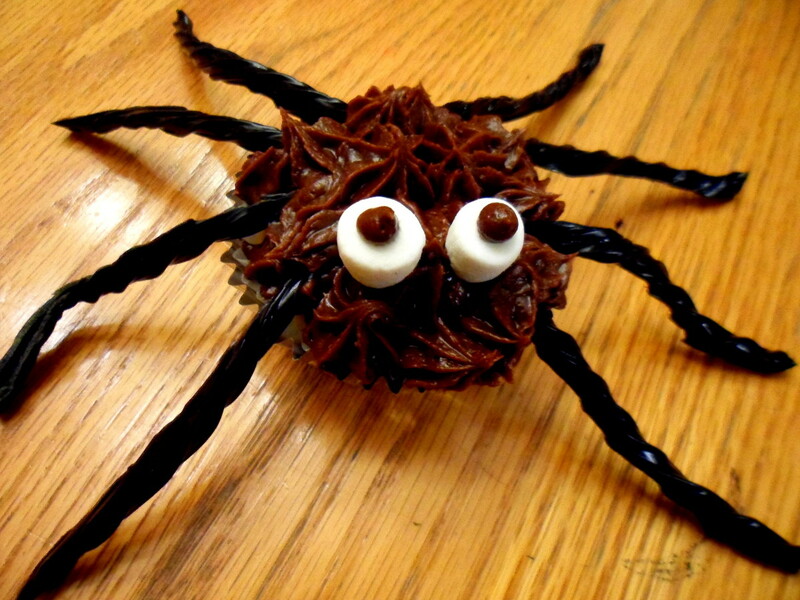 Use black or brown colored icing to create the spider legs and drops of white icing for the eyes. Add different colors of gum drops to each cupcake. Create the legs with black or brown colored icing and drops of white icing for the eyes. Place an Oreo on the top of each cupcake. Add chocolate dipped pretzels for the legs and drops of white icing for the eyes. Add an egg shaped chocolate candy to the top of each cupcake. Use black or brown colored icing for the legs and drops of white icing for the eyes. Create a spider web using white, brown, or black colored fondant or meltable chocolate. Allow time to set and cool before adding to the cupcakes. 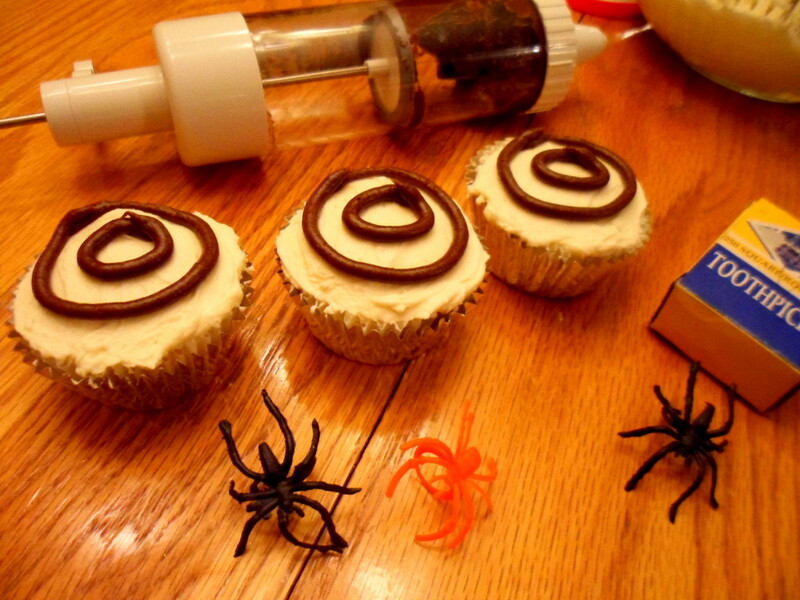 Which spider themed cupcake decorating idea is your favorite? 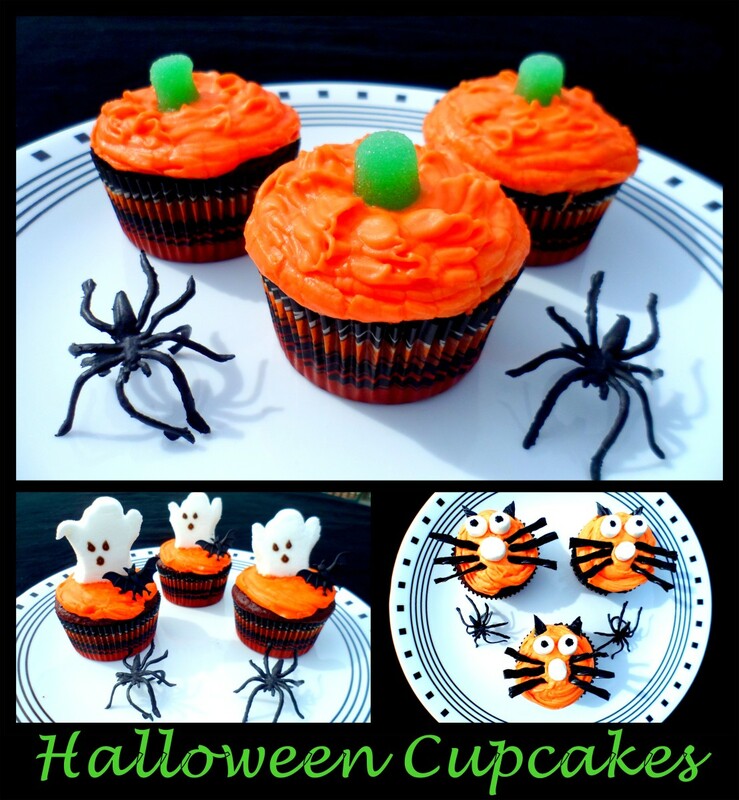 All of the above easy cupcake decorating ideas are the perfect addition to any Halloween party or birthday celebration in the month of October. Arrange your cupcakes on a cupcake stand or serving platter and add fake spider webs or plastic spider rings around your batch to give it a more spooky appearance. 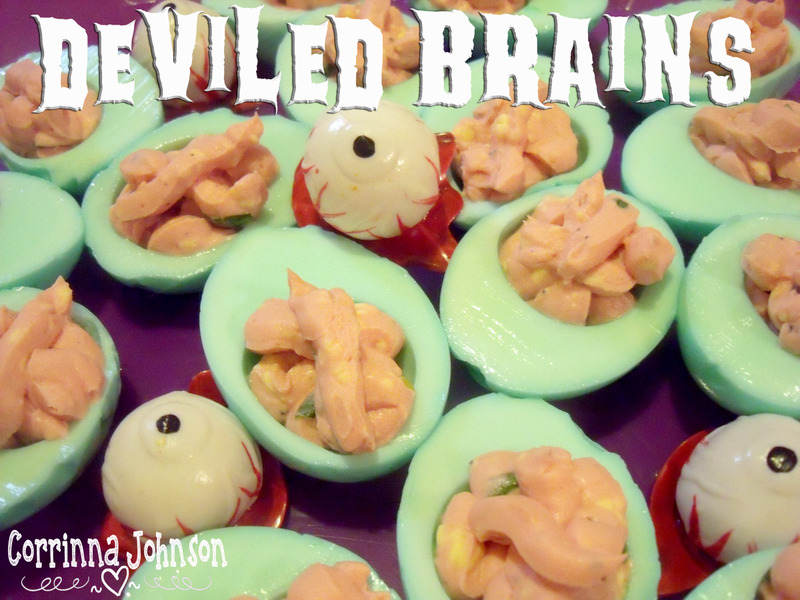 No party guest will be able to resist grabbing one of these fun and yummy homemade treats. 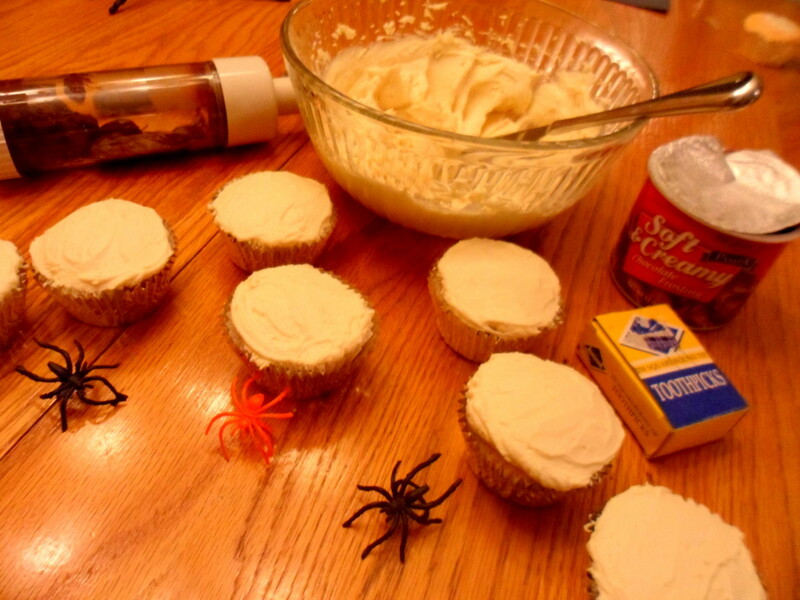 I hope you have found a fun and easy decorating idea to use when creating your own batch of spider themed cupcakes. If you have any questions or comments about the above design ideas, feel free to leave these in the comment section provided below. Alissa, I love this idea for the cupcakes. Voted up for awesome! Thanks so much thebookmom! Hope you and the kids enjoy making them as much as we did! Appreciate you stopping by and commenting! Thanks so much mvillecat! We love Halloween in this house too :) I appreciate the vote up and tweet! So happy to hear you enjoyed the ideas Stephanie! Thanks so much for the vote up and pin! Oh my word, such fun ideas! Can't wait to try the pull apart and the licorice legs...I see cupcake making in our fall future. Great hub! Very cool. I love, love Halloween! These cupcakes are fantastic. I voted up and tweeted. 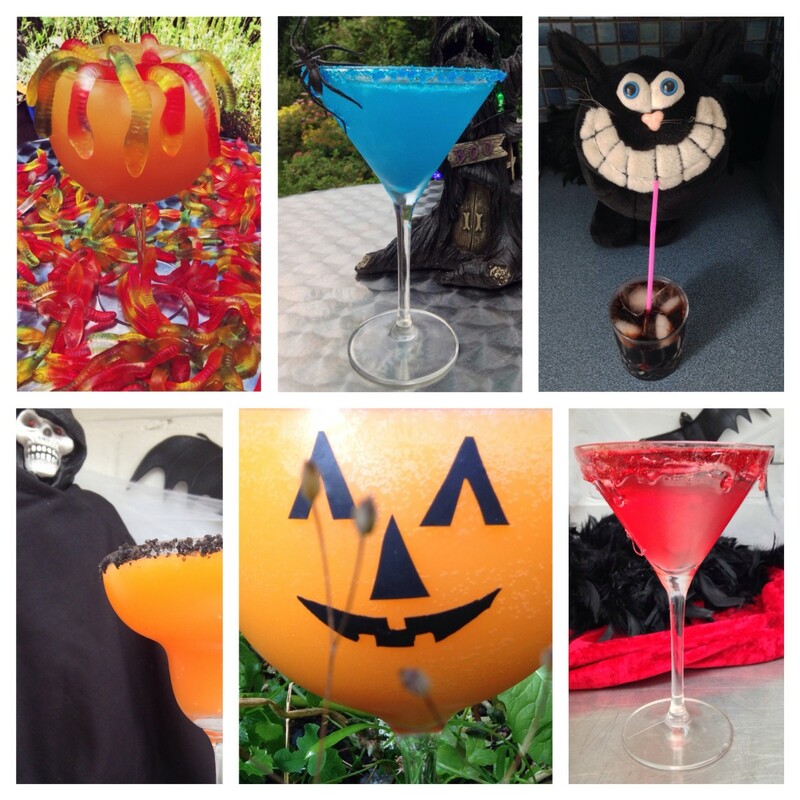 These are terrific ideas for Halloween or for any kids who love creepy crawlies! Voted up and pinned! Thanks so much K9! That is why I love Halloween so much because of all the fun and spooky foods you can make :) Appreciate your visit and for all your sweet comments! Cute, cute, and creepy cute! How much fun are these going to be for Halloween this year!? This hub makes me want to create some creepy crawly food-fun for myself. Great pictures, too! So much fun to had here. Haha I am not a fan of spiders either...but all of these guys are super friendly and oh so delicious! :) Thanks so much for all your kind words, vote up, pin, and tweet - really appreciate all that hub love! YUM! But, I admit, I got a little bit of the creepy-crawlies going while you were talking about spiders. Hehe. 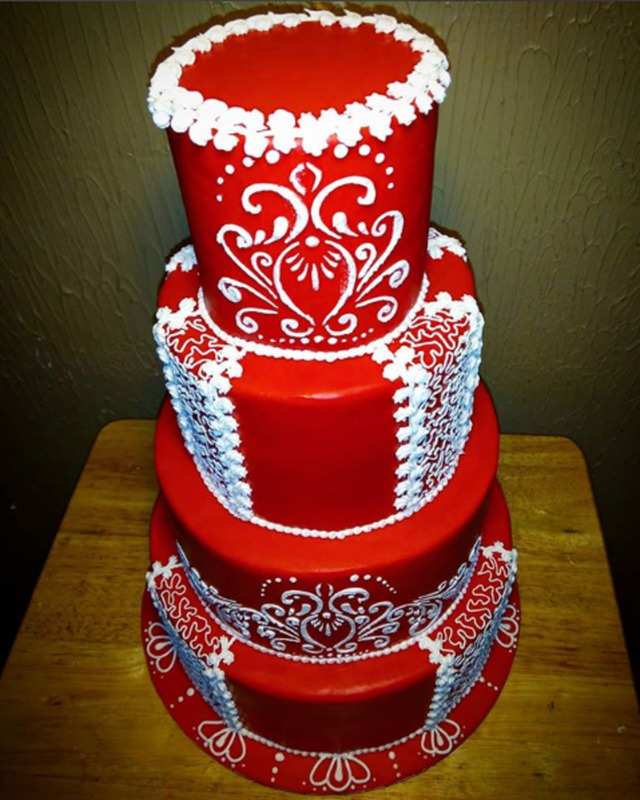 This is so simple and yet it looks so good! I voted up/pinned/tweeted this because the pictures are *fabulous* Thanks! Lol the "Cup Cake Lady" - I love it :) So happy to see you Rebecca and thanks so much for adding your sweet comments! You are definitely the " Cup Cake Lady." 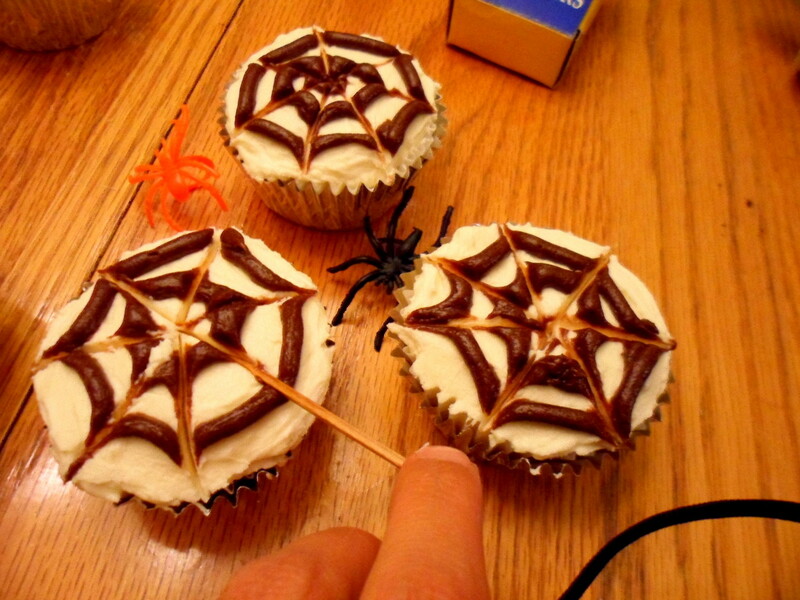 I love the pull-a part spider web cup cakes! Thanks BlissfulWriter! Happy to hear you enjoyed the cupcake ideas! Absolutely, you can pin any picture you would like on Pinterest :) Appreciate you stopping by and commenting! Thanks so much bridalletter! My boys absolutely love Halloween so we thought we would get an early start on some festive cupcakes :) Appreciate you stopping by and commenting! 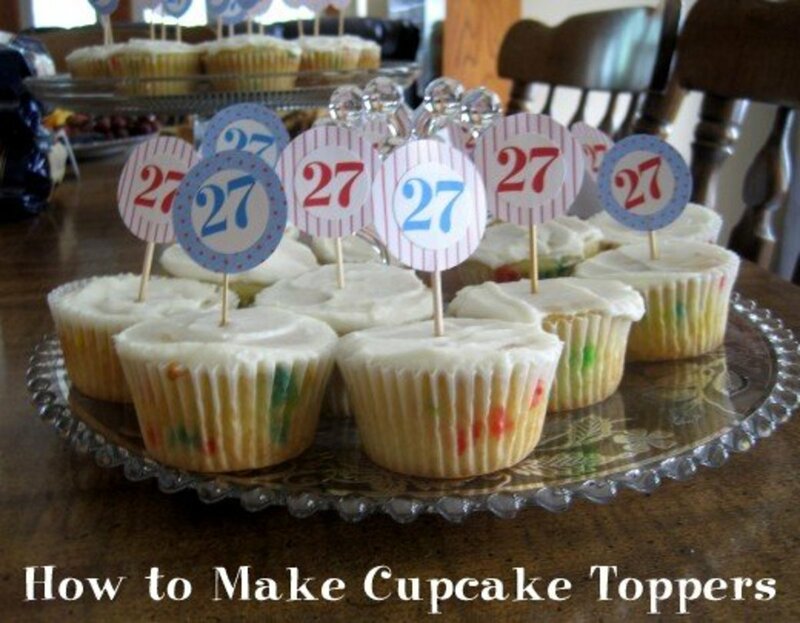 So happy to hear you like the cupcake ideas donnah75! Thanks so much for the vote up, pin, and share! Looks amazing and perfect for Halloween. I can pin the picture on Pinterest? I am a halloween fanatic so I just love these. Thank you for including a youTube video and the instructions. I do like the pull apart cupcakes too. Classic, fun idea for Halloween. Voted up. Pinned and shared.